Install smaller appliances. Smaller and compact appliances can give your small kitchen the same functionality as a larger kitchen, but uses a lot less space. Appliance manufacturers now have more compact, space-saving appliances to choose from, for example refrigerators that are 24 inches deep instead of 30 inches deep or microwaves that can be hung underneath cabinets to save counter space. These smaller appliances are a great solution to designing small kitchens, and they maintain the conveniences of a modern kitchen. Maximize storage. Maximize the efficiency of your cupboards with a system of smart options for the interiors, such as stackable shelves, roll-out baskets, lazy Susans, spice rack cabinets, and cup and plate racks. Also, extra storage can be found under dining benches or in kitchen islands or peninsulas. Go vertical. When space is tight, use your vertical space. Stacking your kitchen cabinets vertically can give compact kitchens as much storage as some larger kitchens. Especially if your home boasts high ceilings, tall, vertical cabinets are not only stunning visually, but they add a lot of storage. Seating. 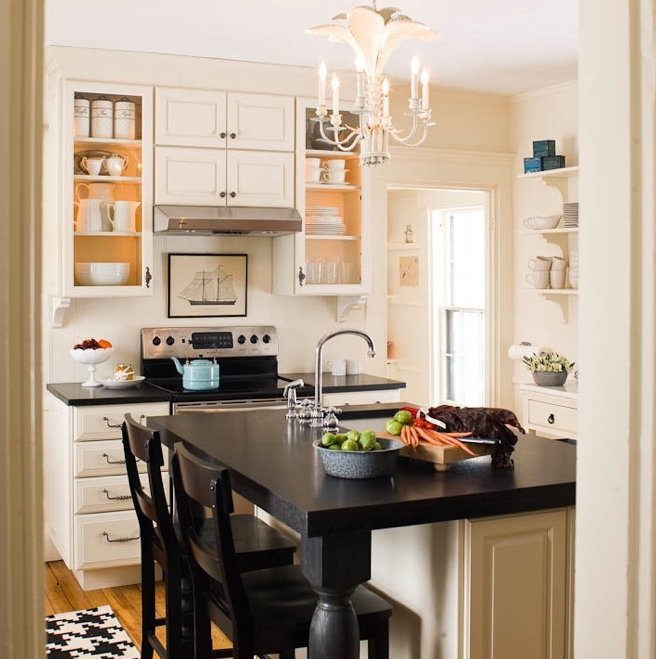 Since much of family life and entertaining happen in the kitchen, being able to provide seating, even in a small kitchen space, is something every homeowner would like to have. Bar stools are a perfect solution. Stools that can be slipped under the counter to save space, especially when they match the color of the bar they are nested under creates a unified room, that’s pleasing visually. Rethink the kitchen island. 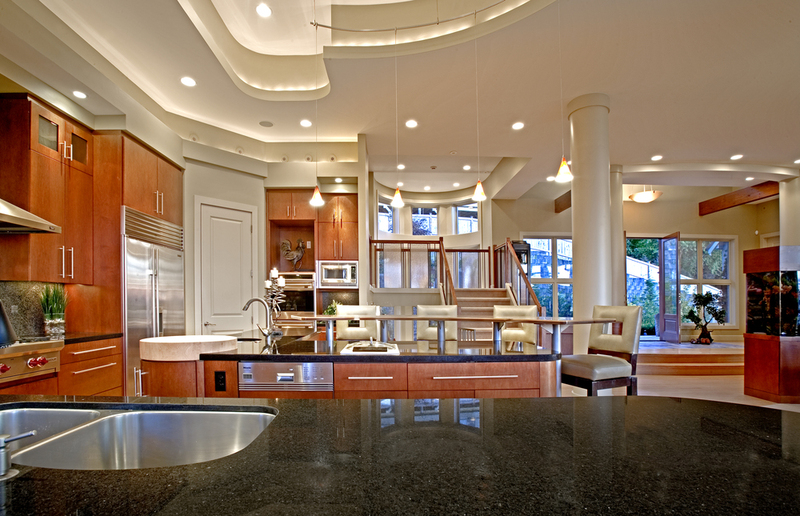 Kitchen islands are very popular, but the reality is they can require a fair amount of space. So, unless you have a big enough kitchen that can accommodate an island, think about a peninsula or even a butcher-block table on casters. Both peninsulas and mobile butcher-blocks or tables are wonderful options for smaller homes. Light. Create the illusion of more space with lighting. Under cabinet lighting or under the counter lighting can make a small kitchen made to appear larger. Windows can do the same thing to a small space. So, when designing your space, whether it be a kitchen, bath or whole house remodel, consider making the room appear larger by putting in a big grand window. This entry was posted in Uncategorized and tagged kitchen design, small kitchen, small kitchen design tips on March 17, 2014 by Seattle Kitchen & Bath Remodel Blog.